In the decade since the Global Political Crisis, mankind has entered its second golden age planning to expand the man's presence further in the Galaxy. But all the plans for the prosperous future crashed with the abrupt appearance of the hostile alien fleet destroying everything on its way. Humans found themselves on the verge of extinction. 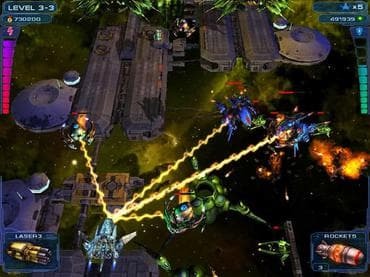 Star Sword is a stunning comeback of the classic space scroller that lifts up the level of action, dynamics and drive in modern arcades. The detailed setting along with spectacular graphics abundant with modern visual effects and atmospheric futuristic soundtrack in the Hollywood style will not leave you indifferent and challenge your reaction and stamina by rash action operations in five immense worlds. Download free full version pc game today and win ferocious battle! If you have questions about Star Sword game, please contact us using this form.